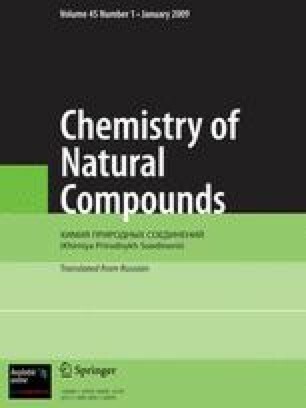 The composition of the essential oil of wild bergamot bee balm introduced into the Krasnodarsk Krai has been analyzed by chromatomass spectrometry. The essential oil contains 34 components of which the main ones are α-pinene (3.5%), β-pinene (2.9%), α-terpinene (1.7%), p-cymene (32.5), an aliphatic aldehyde (6.3%), sabinene hydrate (1.9%), β-caryophyllene (1.1%), the methyl ether of carvacrol (5.5%), citronellyl acetate (1.6%), thymol (12.6%), and carvacrol (24.0%). The compounds were identified on the basis of their mass-spectrometric characteristics and arithmetical retention indices. A. N. Severtsov Institute of Animal Evolutionary Morphology and Ecology, Academy of Sciences of the USSR, Moscow. All-Union Scientific-Research Institute of Drugs, Moscow. Translated from Khimiya Prirodnykh Soedinenii, Vol. 5, pp. 646–649, September–October, 1989.